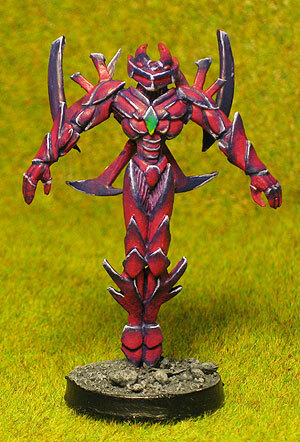 I been thinking for a long time about how to paint the Axion mini I bought shortly after Golden Growler UK 2001. I had an idea base around an illustration of a shard I did. 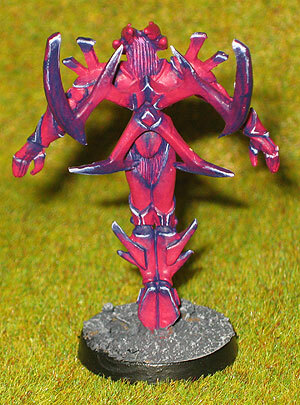 The idea was to paint the whole Axion as I would paint a jewel. I would paint a jewel by painting it a base colour and making it darker and dark towards one corner (of a circle,great) for then to make a white dot in the darkest area. But will it work on a whole miniature? Well it is finished now so judge for yourself. I don’t think it works. It doesn’t have the “glow” effect I was trying to achieve. It works on his legs and arms but his chest and esspecially his head is all wrong. there is too much white so instead of highligts it looks like white stripes painted on like war paint. BUT one thing is for sure, I am not painting a complete Shard army this way. When I rate my own work I not only take in account how it turned out, but also how long it took. I want to be able to paint miniatures I can live with in a minimum of time.